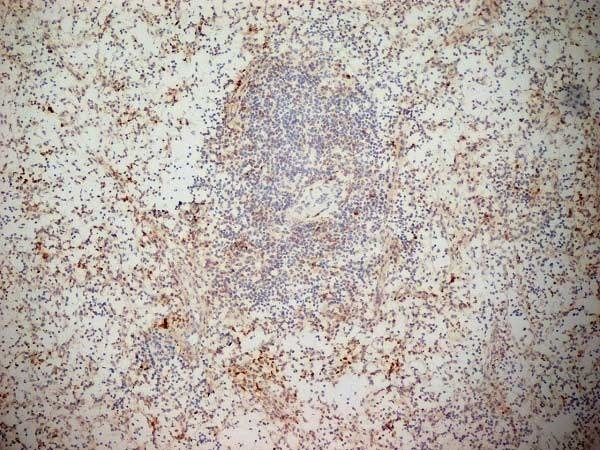 Figure A. FITC conjugated mouse anti human CD8 (MCA1226F) and Alexa647® conjugated Mouse IgG1 isotype control (MCA928A647). 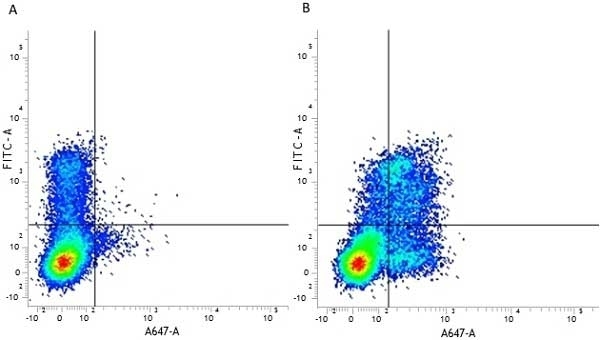 Figure B. FITC conjugated mouse anti human CD8 (MCA1226F) and Alexa647® conjugated mouse anti human CD314 (MCA2405A647). All experiments performed on red cell lysed Human peripheral blood gated on leukocytes in the presence of Human SeroBlock (BUF070A). 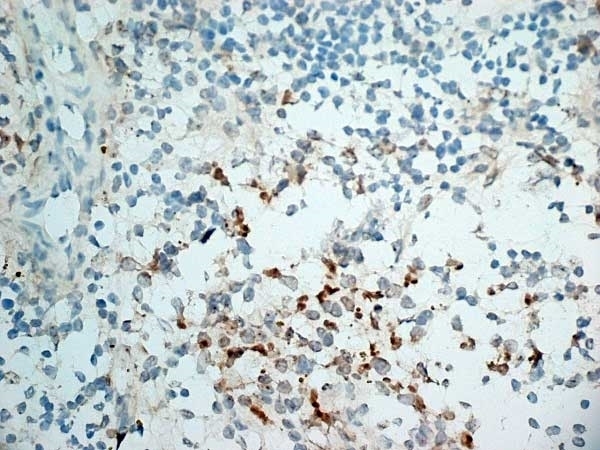 Mouse anti Human CD314 antibody, clone 1D11 recognizes CD314, also known as natural killer receptor G2 (NKG2D) and as killer cell lectin-like receptor subfamily K, member 1 (KLRK1). CD314 is a C-type lectin-like activating receptor which is expressed on most natural killer (NK) cells, CD8 T cells and gamma delta T cells. CD314 forms homodimers that signal through an associated DAP10 adaptor protein. 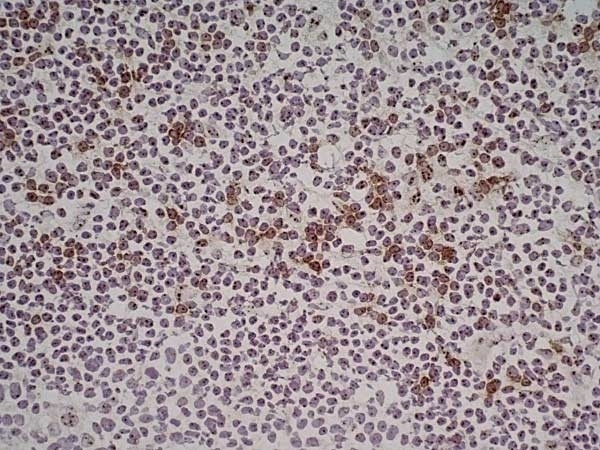 Ligands of CD314 include MICA, MICB and UL16 binding protein (ULBP), which are inducibly expressed. Ligand binding toCD314 results in NK cell activation and potent co-stimulation of effector T cells. Mouse anti Human CD314 antibody, clone 1D11 is reported to inhibit T cell recognition of MICA (Bauer et al. 1999). 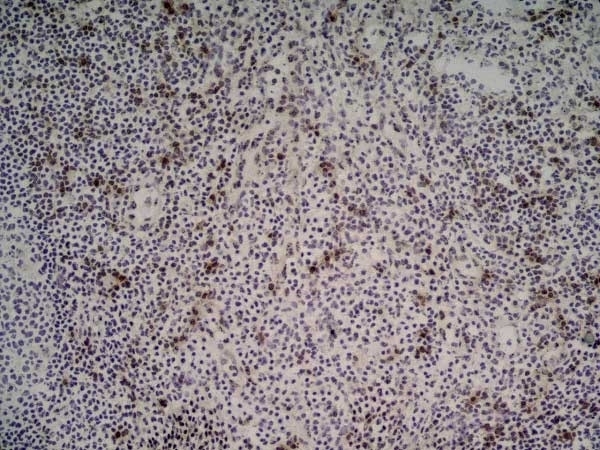 Spleen cells from immunised RBF/DnJ mice were fused with cells of the p3 mouse myeloma cell line. Bauer, S. et al. (1999) Activation of NK cells and T cells by NKG2D, a receptor for stress-inducible MICA. Das, H. et al. (2004) Mechanisms of Vdelta1 gammadelta T cell activation by microbial components. J Immunol. 172 (11): 6578-86. Groh, V. et al. (2001) Costimulation of CD8alphabeta T cells by NKG2D via engagement by MIC induced on virus-infected cells. Nat Immunol. 2 (3): 255-60. Jinushi, M. et al. (2003) Autocrine/paracrine IL-15 that is required for type I IFN-mediated dendritic cell expression of MHC class I-related chain A and B is impaired in hepatitis C virus infection. J Immunol. 171 (10): 5423-9. Roberts, A.I. et al. (2001) NKG2D receptors induced by IL-15 costimulate CD28-negative effector CTL in the tissue microenvironment. Holmen, C. et al. (2007) Anti endothelial cell autoantibodies selectively activate SAPK/JNK signalling in Wegener's granulomatosis. J Am Soc Nephrol. 18: 2497-508. Sugita, J. et al. (2010) Differential effects of interleukin-12 and interleukin-15 on expansion of NK cell receptor-expressing CD8+ T cells. Gumperz, J. et al. 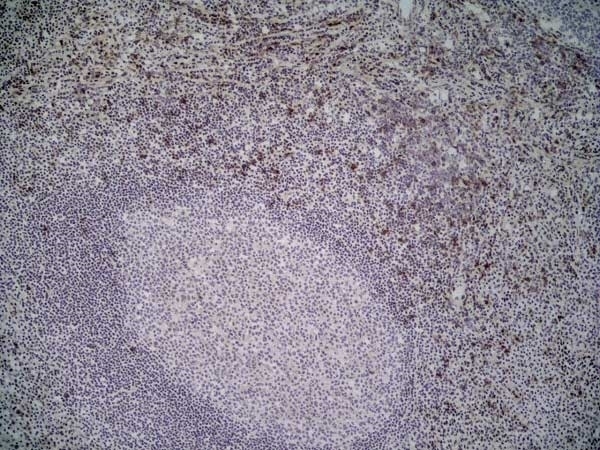 (2002) Functionally distinct subsets of CD1d-restricted natural killer T cells revealed by CD1d tetramer staining. Wu, J. et al. (2002) T cell antigen receptor engagement and specificity in the recognition of stress-inducible MHC class I-related chains by human epithelial gamma delta T cells. Wu, J. et al. (2000) DAP10 and DAP12 form distinct, but functionally cooperative, receptor complexes in natural killer cells. Groh, V. et al. (2003) Stimulation of T cell autoreactivity by anomalous expression of NKG2D and its MIC ligands in rheumatoid arthritis. Voigt, J. et al. (2014) Human natural killer cells acting as phagocytes against Candida albicans and mounting an inflammatory response that modulates neutrophil antifungal activity. J Infect Dis. 209 (4): 616-26. Matzner, P. et al. (2013) Resilience of the immune system in healthy young students to 30-hour sleep deprivation with psychological stress. Proc Natl Acad Sci U S A. 100 (16): 9452-7.